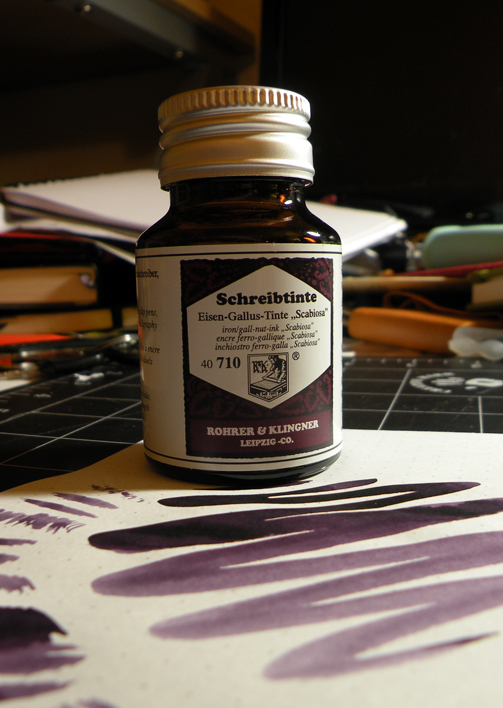 I don’t typically review ink, but I’ve been compelled by the consistently impressive performance of this ink to give it its own review. The Scabiosa always seems to have good, practical drying times when I actually write with it—I don’t have to stop to let the page dry to keep from smudging while I write, whether I’m using fine, medium, or broad nibs. But even more impressive is Scabiosa’s ability to overcome most any crappy paper. 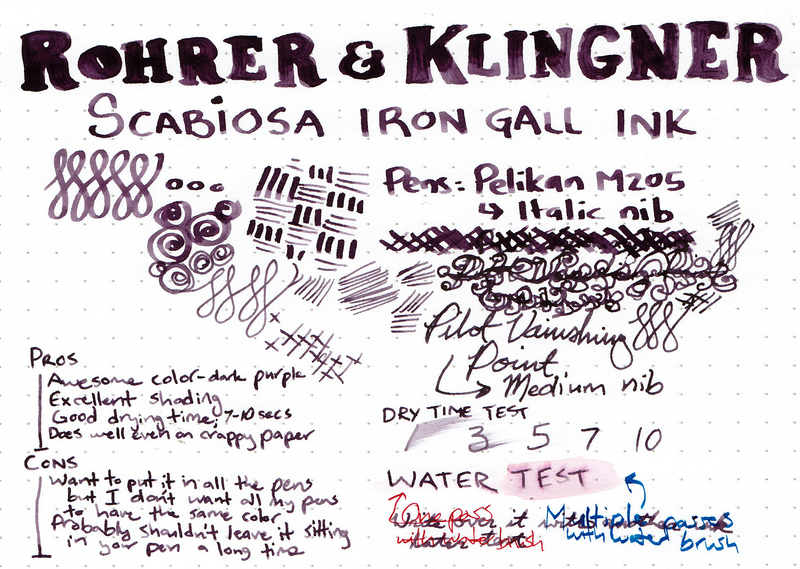 The Scabiosa consistently outperforms other fountain pen inks on subpar paper. 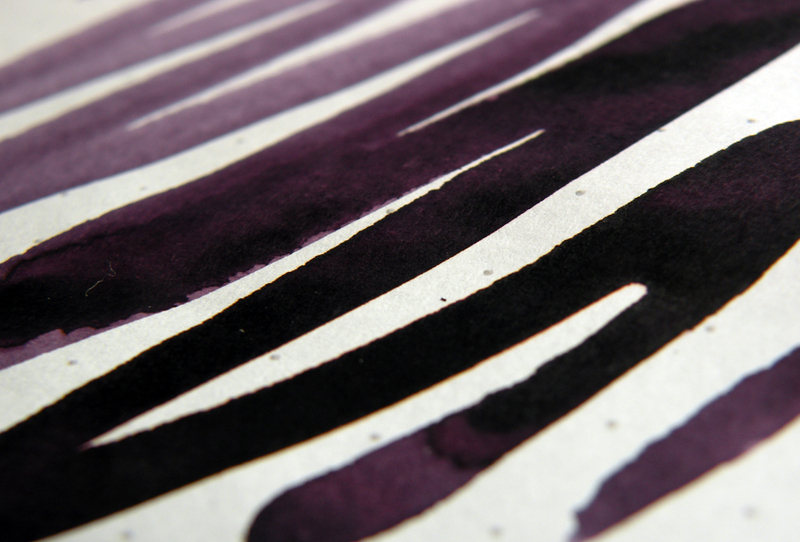 This is what you want to see in a daily use ink. It will take some truly terrible paper to get Scabiosa to misbehave—it tends neither to bleed through, show through, fuzz, nor feather. Can ink have superpowers? Can ink be a super hero? Scabiosa is a modern iron gall ink. It has archival properties (water resistant), but being a modern formulation this iron gall ink isn’t going to eat up everything the way old iron gall inks would. That said, I can’t speak to how finicky antique pens made with delicate or temperamental materials might respond—I don’t have any such pens to test it with. The Goulets and Rorher & Klingner recommend not leaving it in your pens for more than a week, as it may stain; I’ve had some in my Pelikan M150 for over a month—I cleaned the pen out, and there was nary a stain to be found. Are there any downsides to this ink? I certainly haven’t found them yet. I haven’t left this one in a pen for very long, but I’ve had the same cleaning experience with R&K Salix. Left it in my TWSBI 580 for at least a month, maybe a week or two longer and it cleaned out perfectly. No staining at all. These two are such great inks. Nice review! I must admit that though I have purchased a bottle of this already I still have not actually tried it! I really do like IG inks, though. I have a bunch from chemist members on FPN that I need to try, too. It occurs to me you might also like Ecclesiastic Stationery Supplies Registrar’s Ink (ESSRI). It has a pretty fabulous color change.